Ensaïmada of Mallorca, Spain: Porky Pastry Goodness – Just One Bite, Please? What, you’ve never heard of the Ensaïmada? Well neither did I until watching “Spain; A Culinary Road Trip” with Mario Batali, Gwyneth Paltrow, Mark Bittman, and Claudia Bassols that aired on PBS in December 2009. I was intrigued by this pastry. A sweetened yeasted dough that is stretched and rolled up like strudel but rather than melted butter to separate the layers, lard is used. 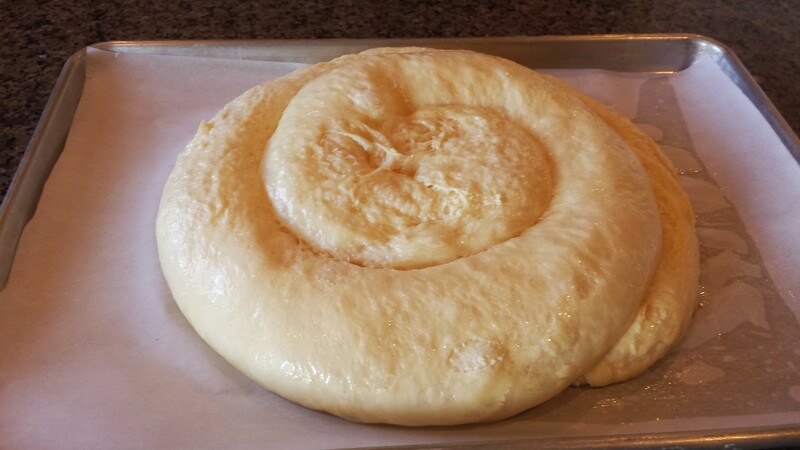 The rolled length of dough is then shaped into a spiral and then left to ferment for 12 hours before baking. The traditional filling is Cabell d’àngel (literally angel’s hair) made from spaghetti squash, sugar, honey, salt, lemon zest, and cinnamon. Cooked until the squash is candied and the sugar thickens. I had to learn to make this. So off I went on a search to find a recipe. Guess what? There was little information about the Ensaïmada. Let alone how to make it. So what was I to do? Remembering the words of Chef Haas, “Challenge yourself to learn new things while remembering and applying what you know “ Words that I live by when it comes to lifetime of learning and executing baking techniques and processes of traditional food ways from other cultures. Chef Haas gave me these words of wisdom as an apprentice chef under his watchful eye. Piecing together the ingredients, recipe, and process would come from past experiences with strudel dough and watching the episode where Mario and Claudia get a lesson on how to roll, stretch, and shape the Ensaïmada from the master himself Miguel Pujol. In a 6 quart sauce pan (non-stick works best) combine the spaghetti squash, granulated sugar, honey, water, sea salt, lemon zest, and cinnamon. Cover with a lid and bring to a boil over medium heat. Continue cooking the squash covered, stirring occasionally for 1 hour or until tender and the strands have separated. Uncover and let the sugar mixture cook down until the sugar/honey becomes thick and translucent. In the mixing bowl combine the all purpose flour, granulated sugar, sea salt, and instant yeast. Stir together with a fork, create a well in the center of the flour mixture and set aside. In a measuring cup, add the eggs and lightly beat, add enough warm water to make a total of 1 1/4 cups (10 fluid ounces), add the lard and olive oil and whisk with the fork to combine. Pour the liquid mixture into the center of the flour well. With the fork slowly combine the flour and liquid together, working from the center out. Continue to mix until the dough comes together and forms a mass. The dough should be soft and sticky. Use a plastic scrape to scrape down the sides of the bowl and turn the dough onto the work surface. Knead the dough with one hand for 6 to 8 minutes. Scraping the dough off your hand and work surface as you knead. The dough should become smooth and elastic during this time. Divide the dough into 2 equal pieces and form into a tight round. Rub a light amount of lard all over the pieces of dough. Place seam side down on the work surface and cover with the 8 quart bowl or plastic wrap. Let rest for 1 hour before shaping. Beat 1 1/2 cups of lard to soften and make it spreadable. Each Ensaïmada will get 3/4 cup of lard spread over the surface. Spread 1/2 cup of lard over the work surface covering and area that is 2′ x 4′ from the edge of the work surface away from you. Uncover the dough and working with one piece at a time. Place the piece of dough into the center of the lard covered work surface. Lightly stretch the dough to lengthen it to about 14 inches or so. Using a rolling pin that has been rubbed with lard. 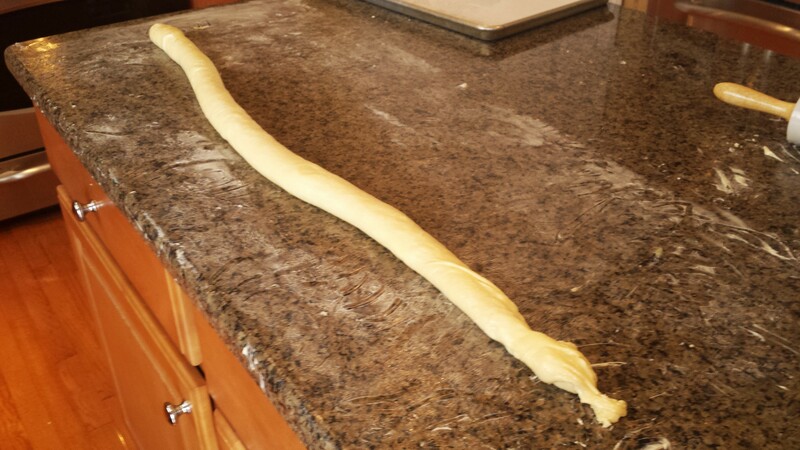 Roll the dough out length wise to make it about 2 feet long and 10 wide. Using your finger tips, spread 3/4 cup of the beaten lard evenly over the dough, covering the entire surface. Starting on the top edge. Lift and stretch the dough gently. Start on the left side and work across to the right side. Lift and stretch the bottom edge of the dough starting at the left side working to the right side. The dough will now very thin. Pull the bottom edge of the dough over the edge of the work surface. Cutting the extra dough off and placed the dough at the top edge of the stretched dough. Place a line of filling that is about 1″ in diameter on the cut piece of dough at the top edge. Using your palm start to roll up the dough starting on the top right side. Rolling and enclosing the filling in the dough. Continue rolling the dough into a cylinder until you meet the bottom edge of dough. The length of dough will be 2 1/2 feet or so. Let the dough rest for 10 minutes while stretching and filling the second piece of dough. After the filled dough has rested, work from one side to the other, lightly stretch the rope of dough evenly to make it about 3 1/2 feet long. 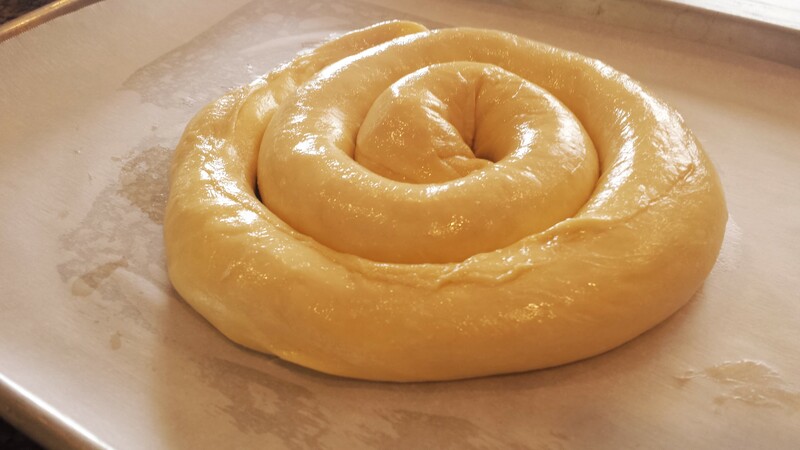 Lay the rope of filled dough out on the surface and starting from the right side, wrap the dough around your hand to form a coil. Move to the parchment lined sheet tray and place the loose end of the coil onto the center of sheet tray. Loosely uncoiling the filled rope of dough clockwise onto the parchment lined sheet tray. Repeat this process to the other piece of dough. Cover the Ensaïmada loosely with plastic wrap, allowing for expansion as the dough ferment. Ferment the dough for 12 hours. It will double in size. Preheat the oven to 400°F. for 20 minutes prior to baking the Ensaïmadas. Remove the plastic wrap from the Ensaïmadas. Place the baking sheets onto two racks in the preheated oven and bake at 400°F. for 26 to 28 minutes. 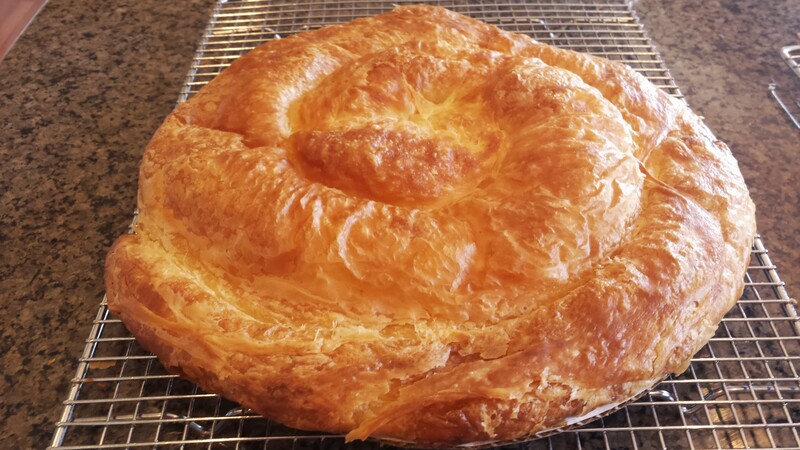 The top and bottom of the Ensaïmada should be a deep golden brown and have a flaky exterior. Turn the sheet trays if necessary during this baking time. Remove the baking sheet from the oven and slide the parchment paper liner onto cooling racks to let the Ensaïmada cool to room temperature. Dust the tops with powder sugar before serving. I saw your post for Ensaimada and wanted to ask a few questions about your recipe. I recall eating this as a kid on our holidays in Menorca and adoring it. I’ve struggled to find recipes that make it as I remember. My memories are of something flaky and soft – very similar to a croissant. Your picture seems to looks how I remember it. All the recipes I have tried seem to be for more of a harder bread. Which is the correct version and does your recipe make the version I recall? 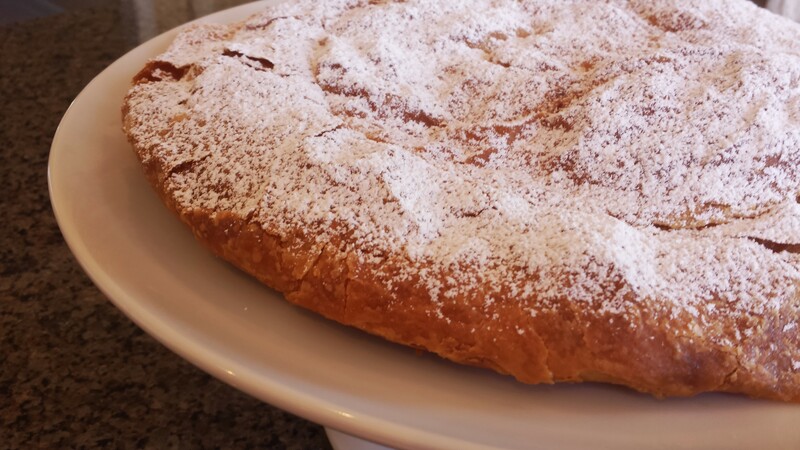 The original Ensaimada from the Island of Mallorca is very flaky, with a soft interior, with a crisp exterior the texture being very much like a strudel or croissant. The process of rolling, stretching the dough has it’s roots in the strudel making process. 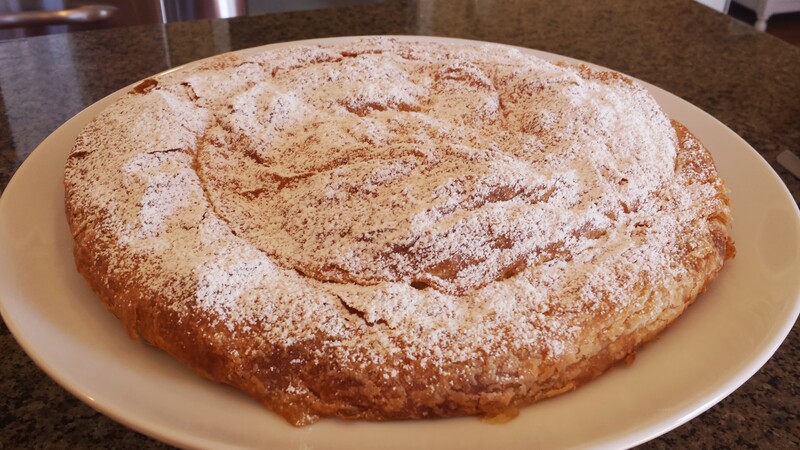 Rather than butter being used to cover the dough, tradtional Ensaimada de Mallorca uses “Lard.” Unlike a strudel dough the dough for traditional Ensaimada has a small amount of “mother” or yeast in it. The dough is stretched just like a strudel, covered with lard, filled with Candied Spaghetti Squash (Cabell d’angel) and then rolled up into a long rope. It is then placed on a parchment lined baking tray and left to proof for 12 hours (overnight) before being baked. The baked ensaimada is then dusted with powder sugar before eating. There are other versions of Ensaimada found around the world that are more like a cinnamon roll dough (sweet dough). I was inspired to create this recipe when I first saw an episode of “Spain: A Culinary Road Trip” with Mario Batali, Mark Bittman, Gwyneth Paltrow and the Spanish actress Claudia Basso. Mark and Claudia visited a master baker in Mallorca who took them through the process of making the this wonderful pastry. When I was researching a recipe for the Traditional Ensaimada I was not able to find one. So using my experience as a professional baker of 29 years I took notes and watched as many video that showed some of the steps in making the Ensaimada. From that I created the recipe on my blog post for the dough and the filling. As it turns out The founder (Paul Saginaw) of the company I work “Zingerman’s” for is good friends with Mario Batalli. Mario has a place in Leelanau, Michigan which he visit very often. So when I heard Paul was going up for a visit. I asked Paul if he would take my version of the Ensaimada to him. Mario’s only critique was it needed more lard. I’ve been revisiting my older blog post and creating a instructional video for my YouTube Channel “Just One Bite, Please?.” I will be creating a full step-by-step video on making the Traditional Ensaimada. It will be available by the end of July. I want to thank you for taking the time to stop and ask your questions. Please let me know if there is anything else I can help you with. Thanks so much for responding. It’s school holidays here so I might give it a go. I made croissant once…man, what a task…this seems like it might be the same effort, but I would love to taste the real thing again after so many years. I’d love to see your final results when your able to make the Ensaimada.